Biomechanical Properties of Marine Mammal Skin - petraditsches Webseite! New energy forms are needed to reduce CO2 output and global warming. For much of the coastal United States, tidal turbines are being considered as a new form of energy. Therefore, the potential environmental consequences of installing tidal turbines must be investigated. One potential danger is the possible injury to marine mammals from collision with a tidal turbine. In this project with the Pacific Northwest National Laboratory (PNNL) we quantify this danger for killer whales (Orcinus orca), harbor porpoise (Phocoena phocoena) and harbor seals (Phoca vitulina). Our collaboration with the local marine mammal stranding program allows us to get skin at the necropsies of the stranded animals. The biomechanical properties of the skin are needed to implement a finite element model determining the extent and severity of a tidal turbine blade strike. 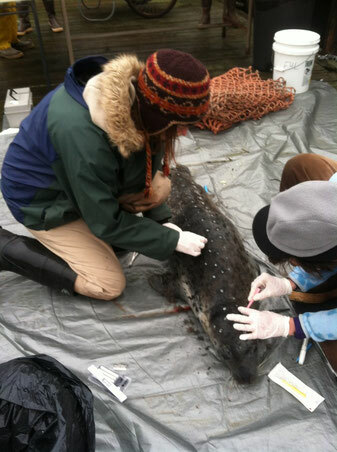 Skin samples were collected from stranded animals postmortem. We perform tensile tests of both the skin and blubber layers to determine tensile stiffness and tensile strength, as well as the strain rate effects. The samples are taken in different orientations (0°, 45° and 90°) to the longitudinal body axis to investigate if anisotropy is present in the tissue. Both types of tissue exhibited a large plastic region, showing non-linear behavior with the amount strain expected in a turbine collision. Results are used to create a constitutive material model in an ABAQUS finite element analysis.